A little late posting this week’s sermon – I’m having a few days off and have only just been able to sort this out. I had a week of preaching as Mother Anne-Marie had the privilege. Here’s what she said. The cross in the picture is the cross that she mentions having brought in the sermon. The Church is which I became a Christian was dominated by a wonderful cross depicting Christ as King. It was only many years later that I came to appreciate how much that image spoke to me and the part it played in my conversion. The service that Easter Sunday morning took me by surprise. It wasn’t as dull as I remembered church being, the hymns were joyful and the sermon entertaining. It wasn’t a happy clappy sort of church – no it was definitely at the high end of the Church of England spectrum. But is was full and it was joyful, and at the end of the service we all went out in the park to let off gas filled balloons and shout “Christ is Risen” – and the congregation shouted that acclamation with gusto. Now it wasn’t an instant conversion for me as it was many months until I went back again – and this time it was Christmas, and you’ve guessed it, my mum and auntie were staying with me again. This time we went into the hall for coffee and a very persuasive woman made me promise to come back the following week. I agreed but had no intention of doing so. But you know what, I did go back and I was there Sunday by Sunday from then on, not sure why, not quite sure what I believed but rapidly becoming involved in a loving and joyful community. And each Sunday my eye was caught by this glorious cross which hung in the centre of the church. I didn’t know how much the image meant to me until three years later when plans were made to knock down the church and build a new church and community centre. By then I had been through, in that church, a moving and emotional conversion experience and I was now an active member of the church including being a member of the PCC. I was therefore involved in all the planning of the new church and I together with many others, felt certain of one thing, this cross should not only be transferred to the new church, but should be its centrepiece – the architect must take that on board and work round it. Now you may be beginning to wonder why I am telling you all this. Well you have probably noticed that today is the feast of Christ the King. It is a feast I always associate with that church where I became a Christian. Becoming a Christian for me was first and foremost an emotional response. It met some deep needs. It spoke to me of community, of belonging, of sharing not just joy, but pain – of being real. But then during a mission week I had an almost mystical experience which brought me face to face with the person of Jesus. In the months leading up to that experience the image of Christ as King on the cross had spoken to me deep within, unconsciously Sunday by Sunday. And when I turned my life to Christ it was to this Christ I turned. He had died on the cross but lived. In humility he had both suffered and triumphed. He now reigned not just in heaven but he had to reign in me and over me. The image of Jesus in king’s robes on a Cross is an ancient image. I’ve brought one with me today – you may not all be able to see it very well, but I will describe it. Usually known by its Latin name – Christus Rex – Christ the King. This particular cross is medieval and French. It is similar to the one that hung in St Philip’s church. It’s a juxtaposition of two images – of the cross, an instrument of pain and torture, and of a crowned king, in resplendent robes, his arms outstretched in victory. He is however, of course, still nailed. The early Christians did not use the cross as a symbol at all. They did not dwell on the cross, because they lived on the other side of Easter Day and concentrated on a risen Christ. The Cross, without any figure on it, did begin to appear in church decorations as a symbol of triumph in the early 400s. 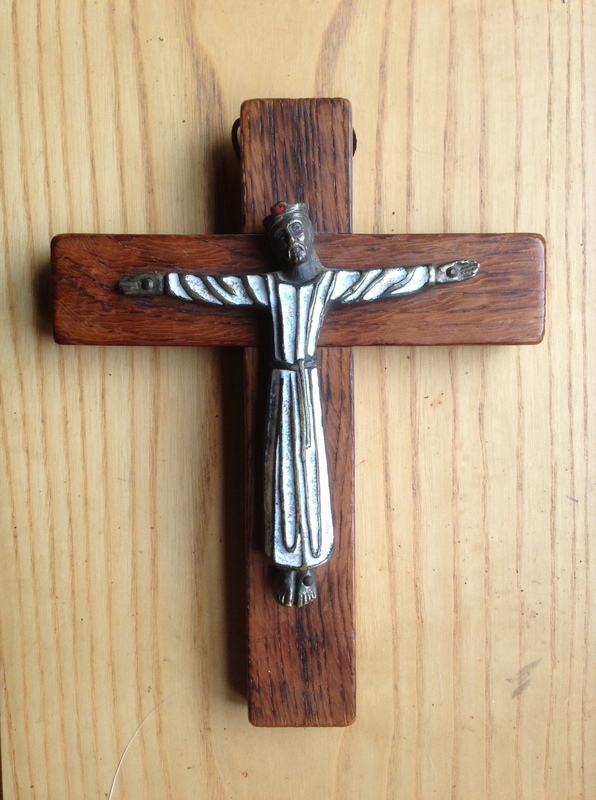 The crucifix we think of as traditional, with a realistic tortured figure on it was an introduction of the Franciscans in the 12th and 13th Centuries. This is a much earlier image, first seen in late fifth century churches, it’s far from realistic and as much a symbol of triumph as is the empty cross. But this has just the hint of suffering – the nails and the head turned to one side. Somehow the whole of our lives, as well as the life of Jesus, is reflected here. Here is a resplendent, triumphant King – the Jesus who rode into Jerusalem with the crowds shouting “Hosanna to the Son and David, blessed is the King of Israel.” Here are our moments of great happiness – being in love, achieving a string of grade A’s in GCSE’s, flying in a balloon over the Grand Canyon, or standing still in a wood on a sunlit day. But here also is the Jesus who stood on trial for his life before Pilate, knowing the cross of agony awaited him. Here also is our pain, the time when our marriage breaks up, the time we wait at the bedside of our sick child, the time we are made redundant, the time we are diagnosed with cancer. There is often in an image so much more than there can be in words. This Feast of Christ the King marks the end of the church’s year. It is a celebration of the all-embracing authority of Christ. It is celebrated in Catholic and reformed churches across the world. It is popular and joyful and marks the end of the period when we have had All Saints Day, All Soul’s Day and here in Britain Remembrance Sunday. In the Northern Hemisphere November is a dying month which resounds with ancient pagan rituals of bonfires and spirits beyond the grave. Placed where it is this feast of Christ the King becomes a triumphant shout that Christ reigns over all in the heavens, that the spirit of evil cannot touch us, and that supremely Jesus has conquered death. What a way to end the Christian Year, not in a whimper but in a triumphant shout of joy at a wonderful New Year’s Eve party for the church. For some of us the Christian Year in the Church of England has ended not quite as we had hoped – it might feel as if there is nothing to celebrate after that vote in Synod last week. But with Christ as King there is always something to celebrate – always an excuse for a party. At secular New Year’s Eve parties, as well as living it up, we often get reflective, and we think about our past life and make resolutions about new beginnings. So it is in the church. Amidst the joy of this celebration we are encouraged to be reflective, to think about how we respond to this King Jesus. In the Gospel we see Jesus before Pilate, seemingly helpless and certainly doing nothing to help himself, talking enigmatically of his kingdom – a kingdom not of this world. “So you are a king”, says Pilate. “You say that I am” replies Jesus. There is a challenge to us to say what we think today. Do we say Jesus is a King? Not just a King but THE KING? Is he King not only of the heavens but of me? Is Jesus all-embracing for us. We are challenged to ask this morning what his all-embracing authority means in our lives. If we call ourselves Christians we ascent to his Kingship over the whole of our lives. We live by God’s rules and God’s values. We cannot celebrate his victory, his Kingship, without assenting to his authority. The feast of Christ the King challenges us to an all-embracing faith. The cross of Christ the King is about wholeness – it speaks to us of triumph and joy, of weakness and suffering. It asks us to bring the whole of our life to God. The tribute King Jesus asks us to lay at his feet is the whole of our life. Are we prepared to do that? Prepared to be seven day a week Christians, to bring him into every aspect of our lives – our relationships, our work, our pleasure, our darker corners. Do we ascent to his authority? This is a feast where we can celebrate our faith and really praise our God, but amidst the praise is a challenge to bring every aspect of our lives under the kingship of Christ. We are the clergy of Saint John's Church in Caterham Valley in the UK. Saint John's is the parish church in Caterham Valley which is on the south side of Greater London just on the edge of the North Downs. Saint John's is part of the Church of England.